The North American Lake Management Society held its 31st International Symposium October 26-28 at the Spokane Convention Center. It had been nearly 20 years since NALMS came to the Northwest, and the Convention Center, on the banks of the Spokane River, offered the perfect venue. The symposium presented a variety of educational and technical information on the theme of Diverse and Sustainable Lake Management. Flowering rush (Butomus umbellatus), an invasive aquatic plant native to northern Europe and western Asia, was first documented in North American in 1897 in Canada’s St. Lawrence River. 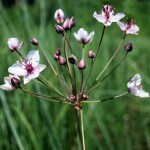 Flowering rush has since spread to many states and provinces along the U.S.- Canada border, often because of its sale as an ornamental pond plant. Once established, the rush can form dense beds, crowding out native aquatic and shoreline plants and interfering with recreation. 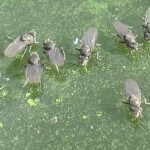 It is also implicated in increasing problems with swimmer’s itch; flowering rush provides habitat to the snails that host the swimmer’s itch parasite during part of its life cycle. Rebecca Dugopolski received a scholarship from WALPA in 2004 to help fund her Master’s research. Her research project involved nine months of weekly sampling to evaluate the effects of an aluminum sulfate treatment on Seattle’s Green Lake. Rebecca also spent six months at Uppsala University in Sweden on a Valle Fellowship. 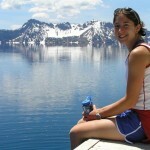 She graduated with a Master’s degree in Environmental Engineering from the University of Washington in December 2005. In January 2006, she began working for Herrera Environmental Consultants in Seattle and continues to do so, specializing in stormwater, water quality, and limnology projects.